The Pumpkin provides a great amount of calories, hydration, and healing compared to the other foods. It can also be worn on your head. When high durability, seeds are dropped when consumed. With the plant giving 3 harvests, they prove to be an easy to farm foodstuff giving massive returns. Can be found on the sides of streams. Wearing this on your head may make you look cool, but your squishy head is just as vulnerable with a pumpkin on it as it is without one on (it offers zero protective stats do your head). 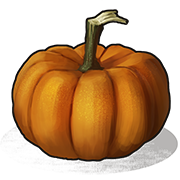 These pumpkinsPumpkin can also stack up to 20, allowing them to be used as a helpful additive to your health during or after a fight. You can find a lot of pumpkins near rivers.